Map Samples - 2008 Maps of the Month - Maps & Facts Unlimited, Inc.
Not all House Prices have Declined! In August, 2007, ULI sponsored a presentation called �Ten of the Valley�s Hottest Intersections�. Will Light Rail help get our Inner City Schools on Track? 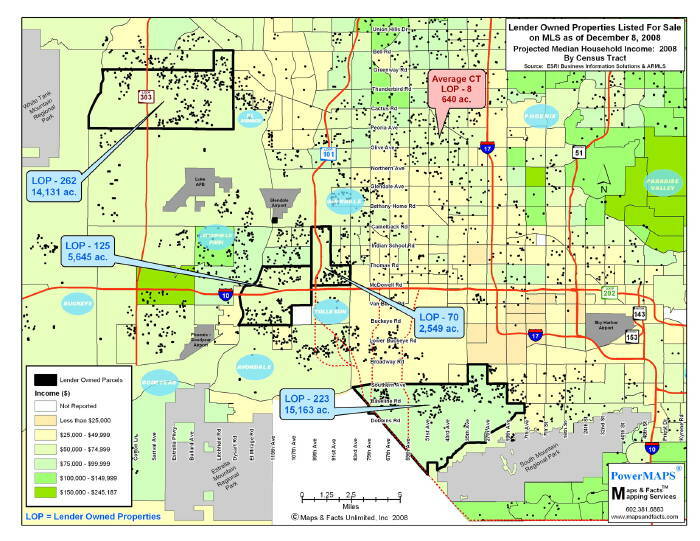 The map shows the Light Rail route thorough Central Phoenix � Good. 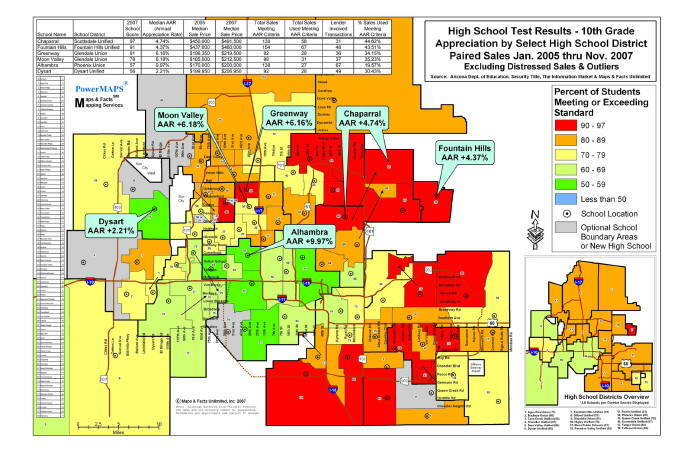 It also shows how Central Phoenix schools have preformed on standardized tests � Not Good. If Light Rail is to attract families (and housing) to Central Phoenix, something has to be done to improve schools. There is a better way! It�s called �True Trade Area� analysis. �True Trade Area� analysis starts by mapping all the targeted data, for example Median Household Income, over a larger geographic area. Then, it is usually easy to visually identify which polygons, for example Census tracts, within the larger geographic area are most similar in relation to a specific location within the larger geographic area. Finally, a common trade area can be logically drawn based on similar demographics. Thus the data, not a contrived ring, depicts the True Trade Area. True Trade Areas come in all shapes and sizes. They will never be rings! 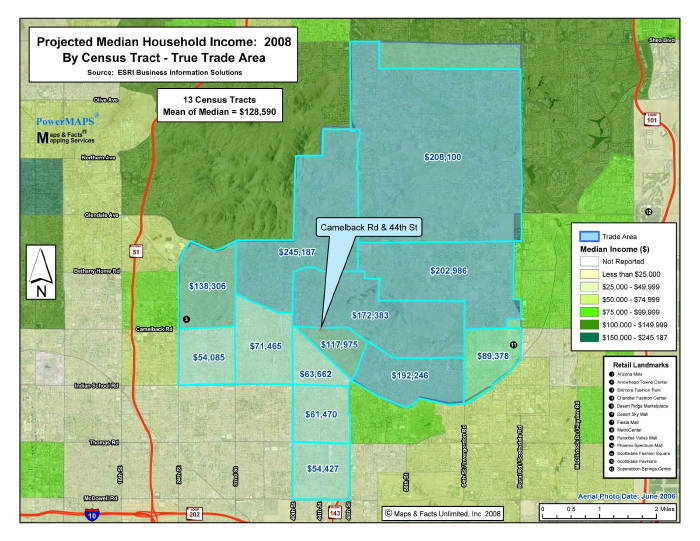 The True Trade Area map shows all Census tracts demographically associated with the intersection of Camelback Road and 44th Street in Phoenix because they share proximity and high median household incomes. 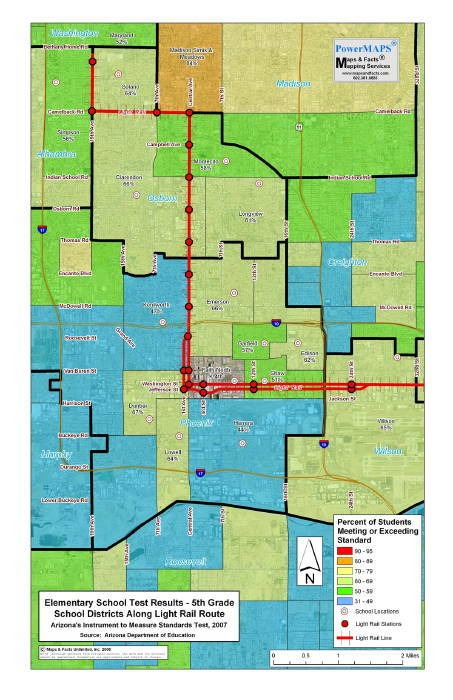 Also included are highly trafficked arterials with similar demographics such as 44th Street, Tatum Boulevard, and Camelback Road. Clearly, the True Trade Area has no resemblance to a ring! The attached �ring� analysis for the same intersection shows that within the ring, household incomes ranged from $42,763 to $202,986. Hardly homogeneous. Even worse, the periphery of the ring bisects 15 census tracts with some, none, or all of their demographic values included in the total depending upon the software assumptions used. Mathematically, a very irregular and misleading saw-toothed non-ring! In our March 2008 Map of the Month, we opined that press reports claiming house prices have declined by 20 percent were misleading and offered Market Evidence that non-distressed prices have actually increased. 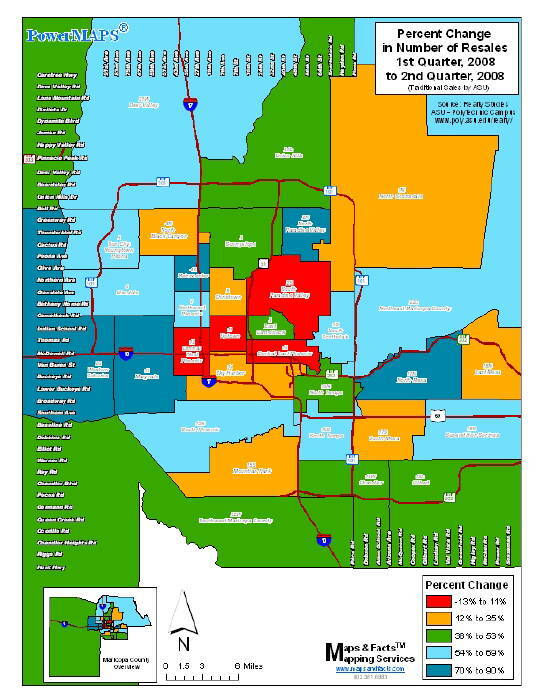 Below is the updated PowerMAP through June 2008 shows that non-distressed prices have continued to increase. Contrary to public opinion fed by the media, not all house prices have declined, at least not since January 2005. 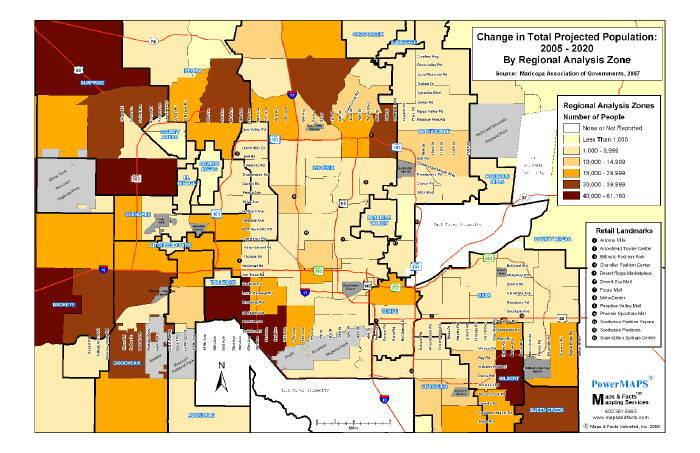 The attached, full size shows Maricopa Association of Governments� (MAG) projected population growth from 2005 to 2020. While the �fringe� areas seem far out today, the next 1,000,000 people will have to live somewhere! 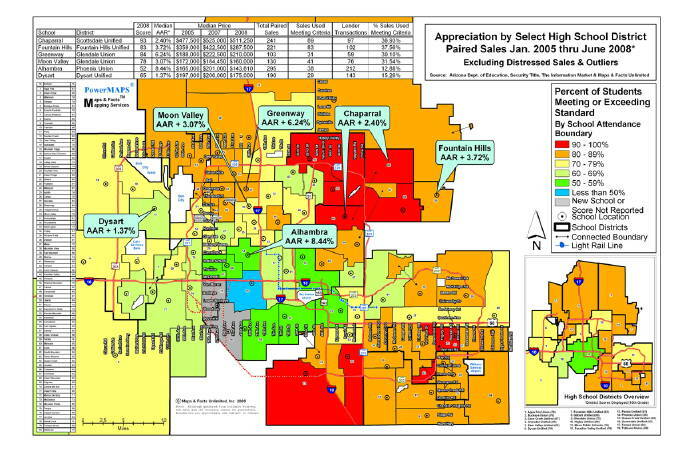 The attached map compares the 5,000+ �Lender Owned Properties� For Sale / Listed in ARMLS as of December 8th, 2008 superimposed over Median Household Income by Census Tract. 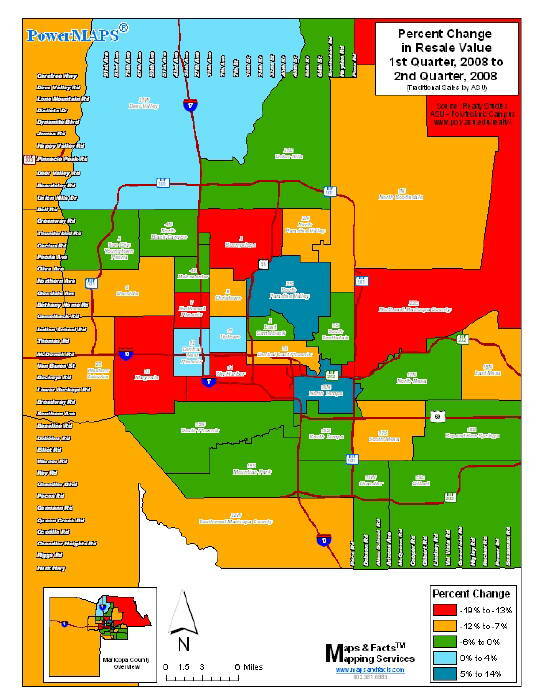 As seen, foreclosures are Valley wide though higher in the newer areas west of Loop 101 ( Agua Fria). The map outlines the census tracts with the most listings. Census tract size in acres is also indicated.